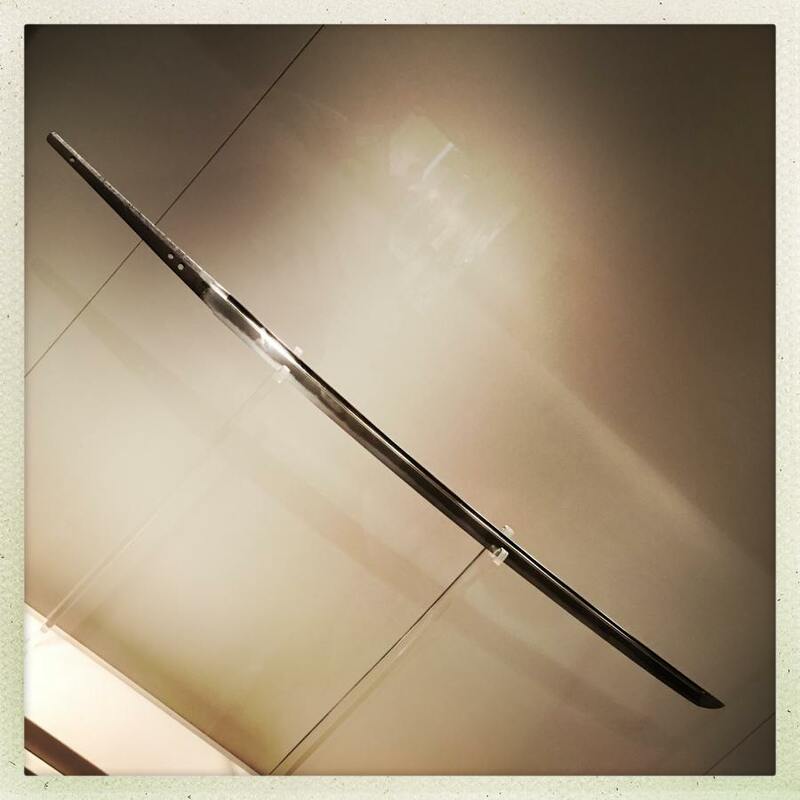 Whenever I make it to the met, I visit the Japanese swords. Some of them, I have considered old friends since I was a kid. To them, I’ll always be a kid. The temper line on this one is extremely prominent. I’m less impressed by it than I would have been a few years ago, because now I know that there’s a lot of burnishing and rubbing with graphite that goes into emphasizing the transition-line. 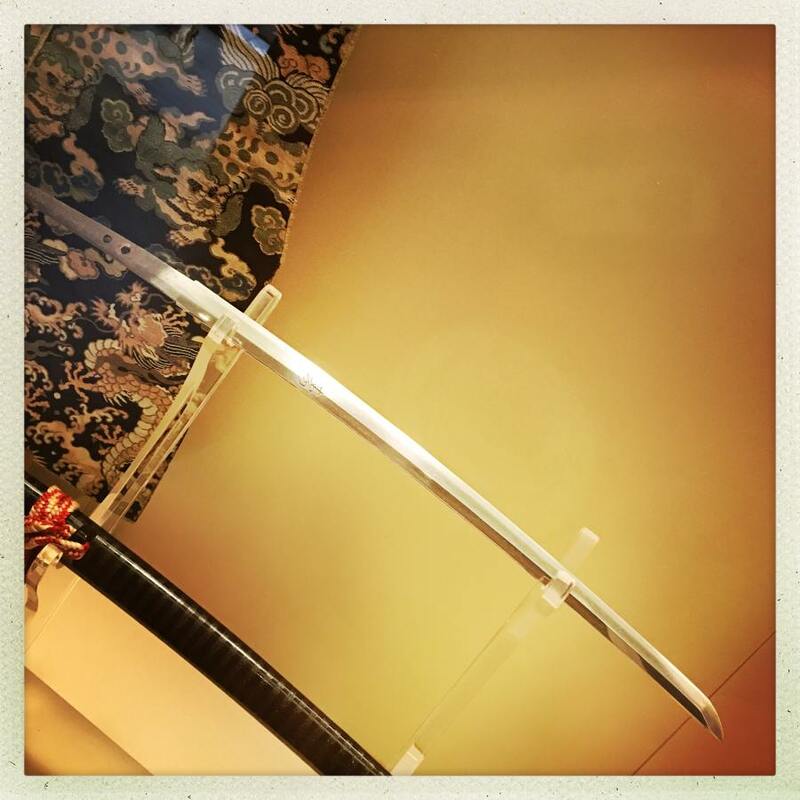 I did something I would not have done before – I craned my head around to the side and looked down the length – which reveals the blade’s edge has been seriously eroded by the many years of polishing. The martensite cloudy edge is harder than the body of the blade, so under endless polishing it tends to abrade less, which makes it stick proud from the geometry of the edge. In my opinion, that’s a polishing job that’s intended to be pretty, not effective, thereby defeating the purpose and the value of the sword. The scabbard, though – it’s wonderful – cherry-bark lacquered onto magnolia wood, it looks like a branch from a particularly straight cherry tree. Exquisite! The temper-line on this one is less well-defined, because the different states of metal (probably because the metal is in different layers) didn’t harden to martensite evenly. This blade would be a more practical battle-blade: hard and sharp and tough. That’s an older tachi-style blade, probably hundreds of years older than the others but still in great condition. The tang has several holes from where it was re-fitted for a new handle, and where it had a two-pinned handle for battle use. It doesn’t have a flashy temper-line or a dramatic curve; this is a no-nonsense sword. I wish I had taken notes or photographed the case labels. But I didn’t. That seems like a more modern piece. Recent sword-smiths have moved from being fancy to being understated and excellent. 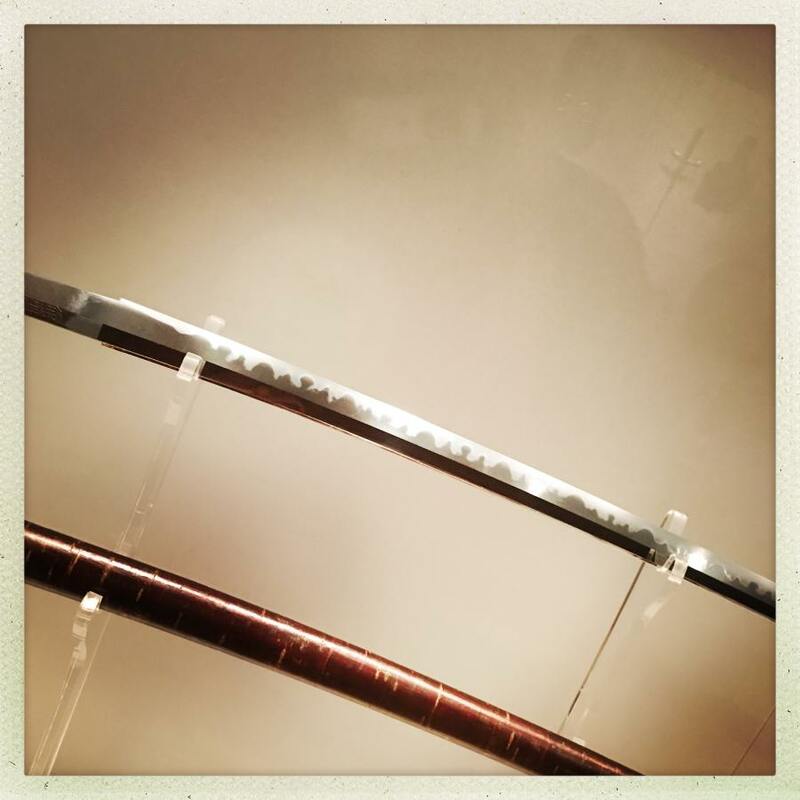 The Sanskrit inscription in the blade is typical of the Zen influence in martial buddhism. The cut-work would have been chiselled into the blade with a hammer and hard little tools, then filled with lacquer. Imagine the potential for slipping and scratching that blade! The grain structure of that steel is beautiful – there’s a lot of layers including some with silicates. It’s not a battle weapon but it’s still strong and beautiful. Blades like these are multi-generational collaborations between handfuls of artists. The sword-smith makes and shapes the blade, then turns it over to another artist who’d make the fittings and another who’d build the handle. Then, it might be carved and passed off for polishing and eventually it would wind up in someone’s hands, who would pull it from the case so it could shine in the light of day. When I was a kid I used to wonder what adventures a sword was carried through. I’m off to Oregon with a suitcase full of metal bars and a couple of blades. Let’s see how this goes! I’m not sure what my posting schedule will look like but I’ll be journaling the class. If bladesmithing utterly bores you, you might want to take a break from this blog for a week. I has envy. 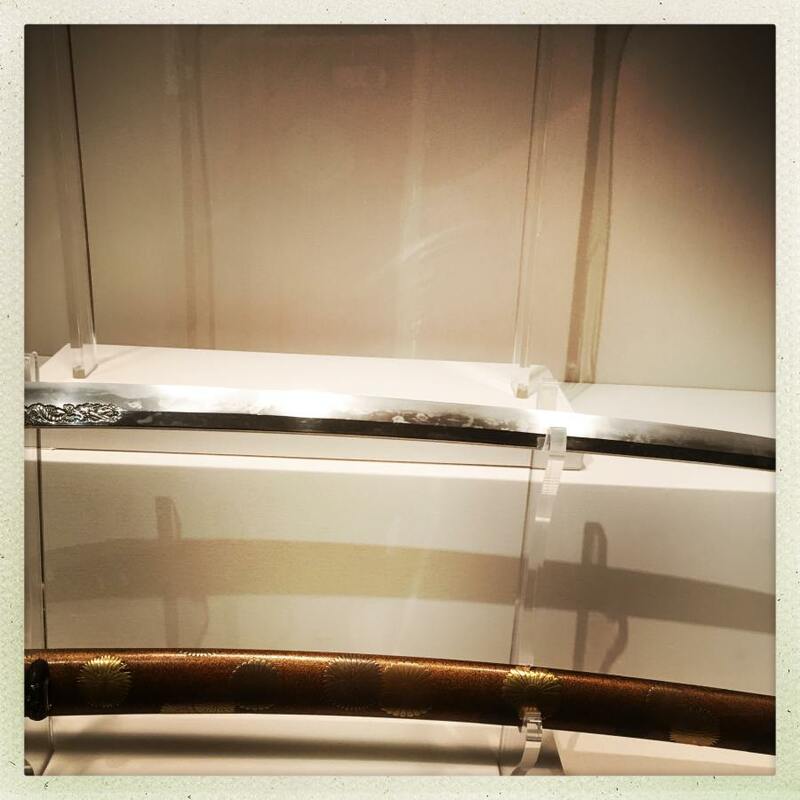 I never had an opportunity to see actual antique japanese sword up close. And the european ones that I have seen I have seen as a little kid and I do not remember anything about them. I should look if there are any museums with medieval weaponry around here and visit them. I should. I won’t. I didn’t know I was interested in blade making until I started reading from you and Charly how involved it is. Now, I’m pissed that I’m too old (too weak) to take it up as a hobby, so I’ll be reading and living vicariously through you. I am with voyager, I had no idea I was interested in blacde making until reading you and Charly. I hope you have a great week learning and that you remember to take lots of photographs. In my opinion, that’s a polishing job that’s intended to be pretty, not effective, thereby defeating the purpose and the value of the sword. 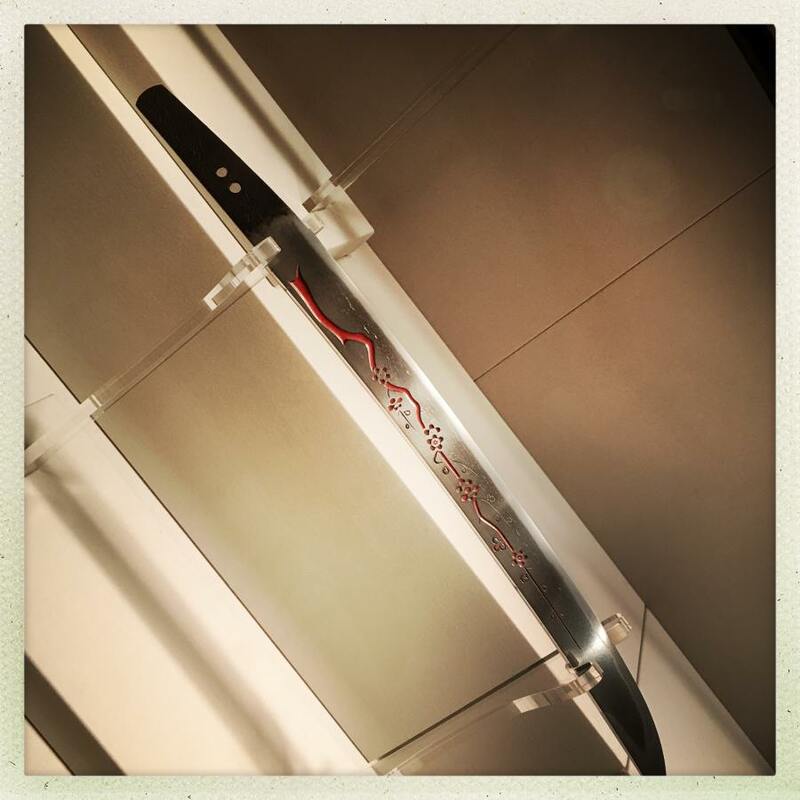 Perhaps you should reconsider the ‘purpose’ of the sword, which is now a display in a museum. It’s job is to look pretty. I’m off to Oregon with a suitcase full of metal bars and a couple of blades. What will TSA make of that? Another entry in your file in various three-letter agencies. Forging blades does look like serious work, but you might be able to do grinding/shaping (stock removal) of knives and small swords? (Depending on your physical condition obviously) With bench grinders and other power tools it seems more like a fine control issue (and you can use various guides). Set it all up so you can do it sitting down. Get the rough shape of the knives water-cut so you don’t have to deal with large pieces of steel. I’m having a go at a couple of knives using hand files and i would rate that low to moderate activity (as a fit-ish 30 year old). It would be easier with a bench grinder.